We began planning the UltraKey 6 generation in 2008 and started the work in earnest in 2009. In the three years of new work since then, we have added a lot of value that meets the eye and as much that does not meet the eye. The most important reason you should upgrade to UltraKey 6 is that you can enjoy all the new enhancements as they are now plus enhancements that will be implemented over the next 5 to 6 years free of charge! No other software company today provides that benefit. Having said this, exactly how is UltraKey 6 different from UltraKey 5? Keep reading. The latest Windows and Mac OS X systems require each application to play in its own sandbox. This is why you no longer find preference files saved together in a common preferences directory on the Macintosh unless they are legacy applications. UltraKey 6 fully complies with Windows 8 and Mac OS X Mountain Lion requirements. Since schools often work with older computers, we have made sure the client still works as far back as Windows 2000, Windows XP and Mac OS X version 10.4. The server software is compatible with Windows 2000 through Windows Server 2008. Apple and Microsoft have notified developers they will continue to constrain their systems. Consequently, any developer who fails to keep up will find their software does not work any more. UltraKey 6 owners will enjoy free updates as the systems evolve for the next 5 to 6 years. √ upgraded every graphic in the program and added new graphics -- over 10,000 separate elements. We replaced the keyboards with photo-realistic presentations. We also sharpened all text elements. Our goal here has been to achieve a high-definition interface. UltraKey 5 compares to UltraKey 6 like standard TV compares to high definition. √ added the UltraKey lab setting so the instructional Window covers the desktop on screens up to 1920 pixels X 1080 pixels. The software still occupies a Window so you (not the software) remain in charge of the computer screen. UltraKey 6 still accommodates netbook screens with resolutions down to 800 pixels wide and 576 pixels high. The UltraKey Window (Windows shown) covers desktops up to 1920 X 1080. The lab and photo-realistic graphics greatly enhance the visual experience. UltraKey 6 still reconfigures itself for netbook screens 576 pixels high. √ re-organized the menus and instructional interface to make the look and feel consistent with new devices such as iPad. Our goal has been to prepare UltraKey 6 for adaptation to mobile and online platforms. Keep reading for details about future platforms. √ replaced the four UltraKey 5 themes with twelve new UltraKey 6 themes featuring attractive photographic desktops. Themes are more than just different desktops. They adapt the software to meet different preferences and special needs such as visual impairment and ADD. Twelve pleasing selections vary for local appeal across the North American, UK and Australia-New Zealand editions. The presented theme (Mac shown) features a night-time city view, large labels on a photo-realistic Mac keyboard, and large text all suited for a user with visual impairment or difficult vision. Notice the delicious Macs in the background. A colored block letters theme (Windows shown) creates a colorful atmosphere for young users with large text, large key labels and colored keys matching correct finger use. The PCs in the Windows lab are as appealing as Macs in the Mac lab! √ created six new instructional videos, one as a general introduction (available at the left sidebar of this page) and five more videos that introduce each activity to the user. The videos provide a valuable overview of each new stage in learning to keyboard and they cheer users on! √ created new Ticker Tips(TM) option for videos. Ticker Tips are text messages that appear at the bottom of the six videos mentioned above. The Tips direct teachers and instructors to critical teaching points and management settings that can be reviewed to adjust the program. A video frame from the video Introduction to Posture presents a Ticker Tip that directs the teacher to a related preference setting. Six new videos are installed with the software with the ability to turn Ticker Tips on or off. Teachers can use the Posture VR video with a projector to explore posture concepts as a class. √ reviewed, clarified, and polished every instructional display and function. Procedures have been clarified and processes have been integrated to enhance the powerful management tool set. √ reviewed and polished the More Information web site that is installed locally with each copy of UltraKey. In UltraKey 6, the web site is sharper and more pleasing, and the information in it has all been updated making the More Information resource even more invaluable for extended keyboarding instruction. √ reviewed, clarified and polished every management process. In UltraKey 6, preference panels, admin functions and class management functions have been refined to make them more understandable and even easier to use. √ enhanced and streamlined processes for administrators to configure UltraKey and easily disseminate configured copies to servers and workstations. √ re-engineered the client software for the latest security requirements of Windows 8 and Mac OS X Mountain Lion. The Network and Multi-computer Assistant found in the UltraKey setup program for Windows enables silent dissemination of UltraKey Windows clients and remains an excellent feature. UltraKey for Windows remains processor-optimized for terminal servers and thin-client environments. UltraKey 6 for Mac OS X is now organized so customers can disseminate just by copying the program folder. √ Add numeric keypad instruction and testing for Mac and Windows. √ Add extra typing activities that challenge users to complete word games and other language activities, providing variety and developing keyboarding fluency. √ Enhance user reports and class reports to provide an easier-to-read format with more information for teachers. √ Add a performance grading system so teachers can translate keyboarding progress and performance into class grades. √ Add performance certificate generation and printing. √ Add a teacher-student messaging system enabling teachers to provide encouragement to users, and receive responses and questions from users. Other new features are on the plan but are not listed above. UltraKey 6 desktop license owners will receive the above enhancements free of charge. Other enhancements listed below will be available separately. Cloud-based data management will enable the desktop format of UltraKey to log into records that are stored on the cloud. The login process will be as seamless as the way UltraKey logs into a school- or district-based UltraKey data server today. Our next release scheduled for summer 2012 will feature optional cloud-based data management so schools and districts can opt to have Bytes of Learning host and manage their data instead of installing the UltraKey Data Server locally. UltraKey 6 is alrady under development for the cloud. Our release schedule is yet to be announced. 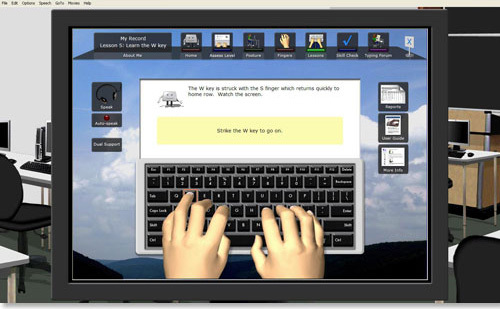 The UltraKey 6 interface has been prepared for ready transfer to mobile instructional platforms such as iPad, Android and other portable devices. When the UltraKey 6 vision is complete, users will be able to log into the same record regardless of what platform they are working on. On every platform, whether it is Mac, Windows, Cloud or iPad, UltraKey will have integrated connection between users and their records and teachers and their reports. 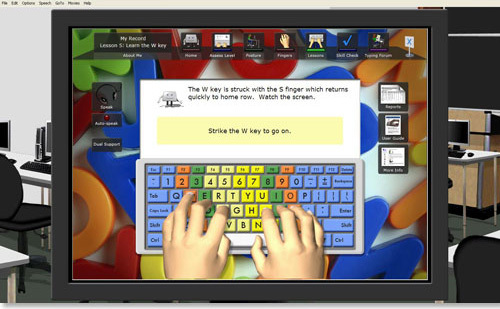 The UltraKey 6 vision is integrated keyboarding instruction and learning management across desktop, cloud and mobile platforms. UltraKey is the product of over 25 years of innovaton driven by interaction with customers. If you have questions or suggestions, big or small, we want to hear them! Now and whenever they arise. Call today at 1-888-8816001 (International ++(281)480-4944. The folloWing table shows upgrade costs for our more popular licenses. In each case, the customer is upgraded to the equivalent permanent UltraKey 6 license. Prices do not apply to home users. If you need a written quotation or have licensing needs not set out above, request a quote. Be sure to indicate the version of UltraKey you have and the number of stations now licensed.